I’ve been on many road trips over the years. I’ve come to dislike having baggage or cargo in the passenger compartment. With my Jettas, anything that didn’t fit in the trunk usually found its way into a 10 cubic-foot cargo bag on the hitch-mounted cargo carrier. 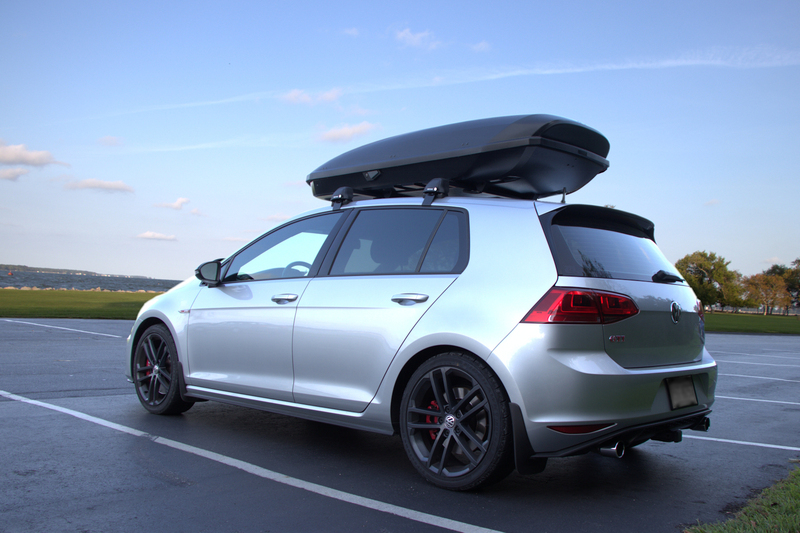 When I first used the same carrier and bag on my GTI, I noticed that the license plate is completely obscured by the load, which is asking for “unwanted interviews” on long trips. The Golf/GTI’s license plate mounts below the rear bumper, making it impossible to see with a load in place. Sure, I could move my plate to the cargo tray, but I’d rather not mess with changing things around on trips or additional lighting. I decided it was time to try a cargo box. Oddly enough, I purchased my cargo box before my roof rack. I took this unusual path because my first need for a cargo box was for a road trip to Ikea, a 300-mile round trip with my trailer, which has a cargo rack. Some of the furniture boxes are longer than my compact trailer, hence the need for a cargo box. Mounting the box on the trailer puts it in the car’s draft, which should result in better fuel economy than if the box was on the car’s roof. I’ll be certain after I conduct some tests. 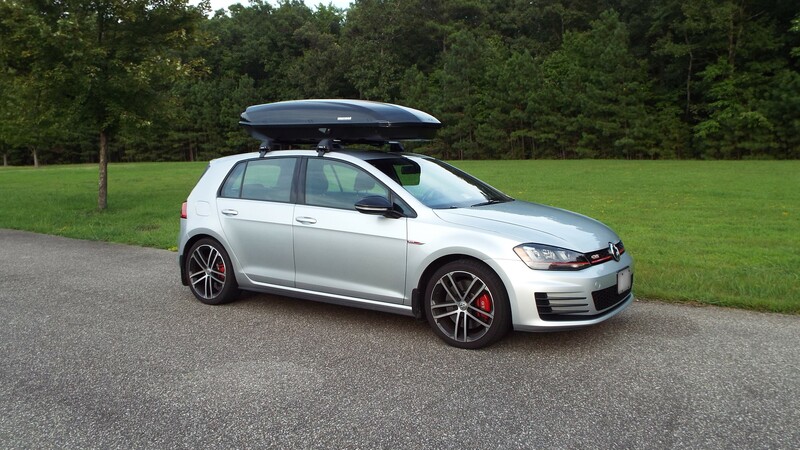 I’ll share my choice of roof rack soon. 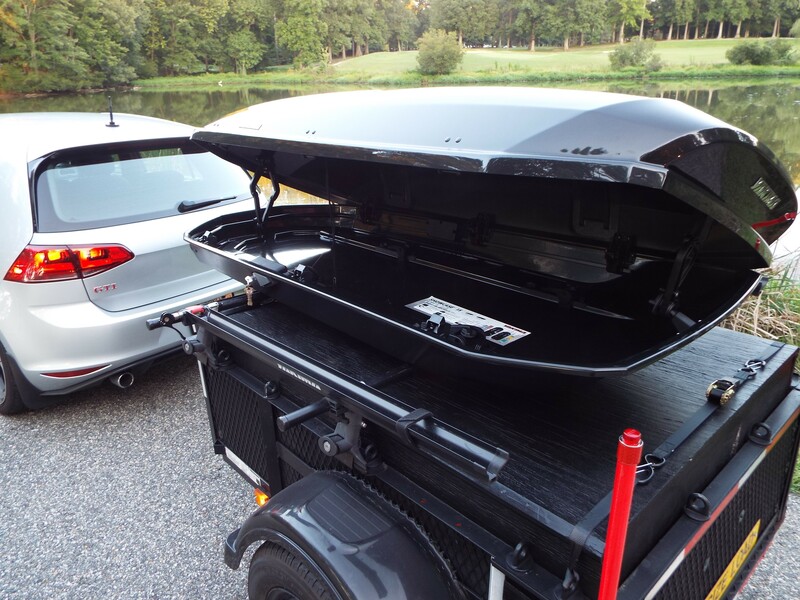 For now, I’ll write about my choice of cargo box, the ShowCase 15, by Yakima. Why buy the ShowCase when there are less expensive options? I already have a slew of Yakima same-key cores, so I knew I’d choose Yakima over Thule or other brands. But why not choose a less expensive Yakima box, such as the RocketBox or SkyBox? I had never owned a cargo box before. But I still knew that I didn’t want my first experience to be with a box that has a flimsy lid or is noisy on the road. Every review I’ve read about the ShowCase indicates that Yakima has learned a lot over the years about improving structural rigidity and aerodynamics. I think all of their research, development, and experience culminates in the ShowCase. I bought it with the confidence that it’s the most rigid, quietest box that I can put on my car. The extra rigidity comes at the cost of more weight. The ShowCase 15 weighs 56 lbs, compared to 46 lbs for the SkyBox 16 and 40 lbs for the RocketBox 14. That translates directly into 10-16 lbs of reduced weight carrying capacity and slightly more effort to lift the box into mounting position. I can live with limiting myself to “only” 100 lbs of cargo on the roof; I’m not going on safari. 😉 I mentioned noise, aerodynamics, and fuel economy above. I’m an analytical type who wants to know “how much noise” and “how much fuel economy” each option provides. So, I’ve done some testing and have shared my results in this entry. I’ve included more info and photos below. I’ll update the album with shots of the ShowCase mounted on the car when I have my roof rack. Update: My Longterm Update reveals some bad news: My Showcase 15 leaks… A LOT! More Space = More Crap! The ShowCase’s appearance reminds me of a “photon torpedo,” as depicted in “Star Trek VI, The Undiscovered Country.” HAHA! I wish it opened just a little wider. If it did, I’m sure whatever cleared probably wouldn’t allow the box to close. Perhaps that was intended by design? Plenty of hatch clearance (except when jackknifed). The box’s setback is perfect and does not extend beyond the back of the box or interfere with the tailgate function. How did you connect the roof rack to the trailer? 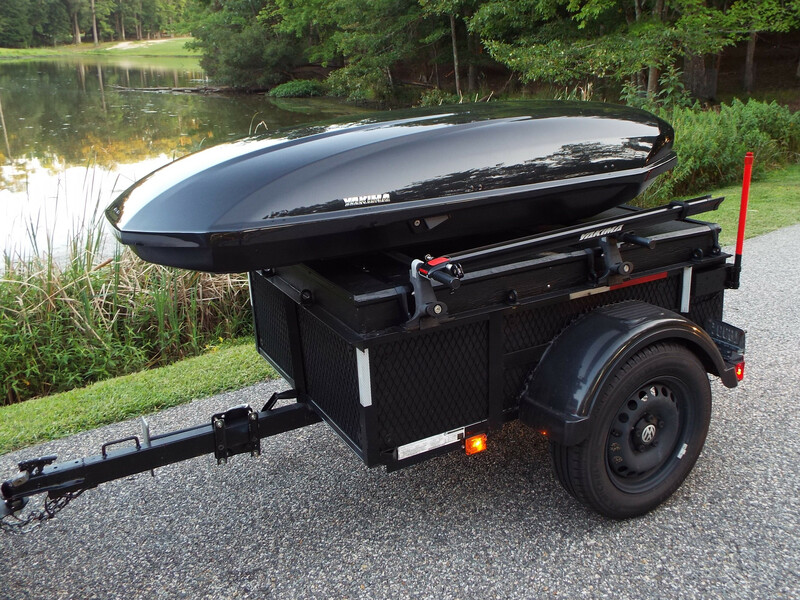 I want to be able to carry a kayak, SUP or cargo box on my trailer. Is that a special roof rack or a standard configuration? Thank you!